View the entire table of contents for the April 30, 2007 issue. What is it about women and goat cheese? Most of America's best goat cheeses are made by women. Rising stars include newcomers like Amelia Sweethardt of Pure Luck in Dripping Springs, Texas, and Debbie Ferrell of Maid in the Shade in Dublin, Texas. 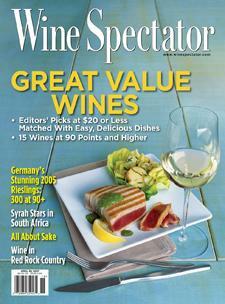 For the full article, check out the new issue of Wine Spectator, on newsstands March 15, 2007.